Our school community is special! 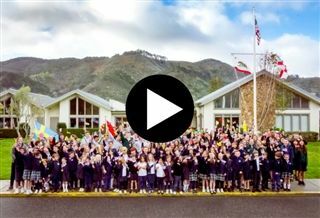 We are a very active school and getting together to celebrate a variety of activities and events throughout the year is just part of what makes our community so warm and welcoming. Some of the events have become beloved traditions that are remembered long past graduation, beckoning alumni to return, such as the Fall Festival, Blessing of the Animals, Christmas Lessons and Carols, Spring Tea, and Graduation. Others are more recent additions such as Clypping Day and the Easter Festival of Flowers, that add to the spirit and richness of school life. And then some events are highlights for the students each school year, like Spirit Days organized by the student council, or Mix-It-Up-Lunch days in which students from all grades enjoy their lunch and fun activities together. And then there is Head for a Day! Each year one lucky student gets to plan a day with our Head of School and then takes over the school for a whole day. Needless to say, these are not your standard school days.